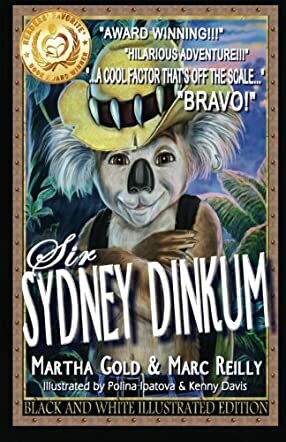 Sir Sydney Dinkum by Martha Gold and Marc Reilly is a hilarious novel that was a joy to read – or hear in this case. I am not that big on audio books, but I made an exception for Sir Sydney Dinkum because I felt that the novel would be good, and I was right. We meet one wonderful koala bear named Sir Sydney Dinkum and, as his name suggests, he is not your garden variety koala bear. He can actually talk to all animals and that includes humans as well. He believes that he can be the biggest hero in the history of the world, or at least one of them. He wants to save the world and, when given a challenge, he faces it head on and never looks back until he has conquered it. He is quite a character. Believe me; I had a smile on my face the whole time. He is charming, his demeanor is very refreshing and, of course, his imagination is quite something. You will know what I mean you hear about the personal life of Sydney, especially his house and the way he describes his dreams of becoming a super hero. The novel is great and the voice for Sir Sydney is hilarious. The imagery was so vivid that I was transported to Australia. I have read many novels set in Australia, but this is the only one that made me feel like I was there with Sir Sydney. The best thing about this novel: people of every age can appreciate the fun and charming adventures of Sir Sydney and that, folks, is guaranteed!